The UN humanitarian affairs chief has expressed deep concern for communities cut off in Syria by months of fighting between government and rebel forces. The situation on the ground keeps shifting, but a confidential UN document leaked to the BBC in late December said more than a quarter of a million Syrians are stuck in "besieged or hard to access areas". Media captionBaroness Amos, UN: "Security situation even worse now that you have fighting between opposition forces"
Starving an area is a war crime. 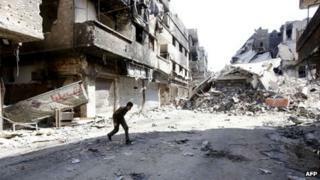 In Syria, food is a weapon of war used by all sides as they try to gain ground militarily, says the BBC's Lyse Doucet. The uprising began in March 2011 and the UN says more than 100,000 people have died in the conflict. Baroness Amos' visit comes less than two weeks before the planned start of an international conference in Switzerland to find a political solution to the war. Foreign ministers from 11 countries that back the Syrian opposition movement met in Paris on Sunday with the aim of persuading the opposition to attend the Geneva II talks. The so-called Friends of Syria said on Sunday that there would be "no political solution for Syria unless Geneva 2 meets". Ahmad Jarba, the leader of the Syrian National Coalition, said it had been agreed that President Bashar al-Assad and his family would have no role in the country's future. But Mr Jarba did not say whether the Coalition would take part in the 22 January talks. The Coalition asserts President Assad has no intention of negotiating his own departure, especially now that the military opposition is itself compromised by the rise of Islamist groups. There is an almost complete disconnect between the effective forces on the ground inside the country, and the Western-backed Coalition - which claims to be the sole representative of the Syrian people, says BBC Middle East correspondent Jim Muir. Baroness Amos said she was "really worried" about people in communities who had been besieged for long periods, in some cases for more than a year. "The sick and wounded have not been able to leave, we've not been able to get food in. She described the situation as "unimaginable". She said the Syrian government had given assurances that they would help the UN to get humanitarian access. "We talked in particular about how we can try to get into these besieged communities - this has been part of the conversations that I've had with the government on a number of occasions. "I have been assured by the deputy foreign minister and also by the foreign minister that the government will do everything that they can to help us to facilitate that access." Speaking on Friday, UN official Christopher Gunness said residents in the Yarmouk camp, including infants and children, have been subsisting on diets of such things as stale vegetables, animal feed and cooking spices dissolved in water. He said infants were suffering from diseases linked to severe malnutrition, including anaemia, rickets, and kwashiorkor [a protein deficiency].